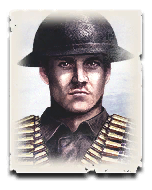 The .sga file should be located in "C:\Users\NAME\Documents\my games\company of heroes 2\mods\tuning". Can you build your mod and confirm it's saved in there? Then startup the game and check again. I had the issue once that the game removed the .sga file because the mod contained a change which wasn't allowed (an edited .mua file in my case). I only tested with one weapon in the .abp at a time, but I don't think those conflict. The first screenshot looks like the weapon state is wrong. Is the hardpoint enabled? 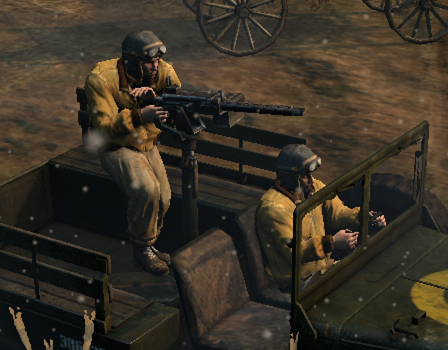 Here I guess you are asking if the DShK 38 can be mounted on the Dodge or the Brem Carrier. The answer is no to both. 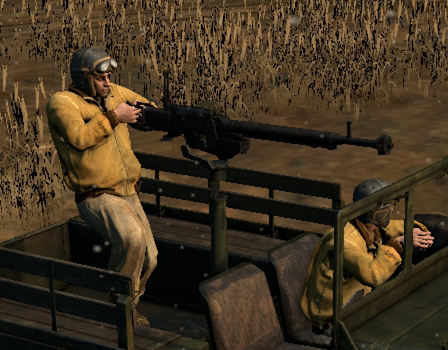 Dodge only supports the .50 cal and Bren Carrier only the Vikers. Can you try the 'NewMotionTree' instead of the 'CompleteMotionTree'? 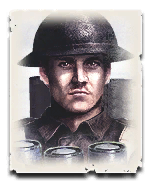 The CompleteMotionTree was used to the standard two factions, but Okw, US and the UK weapons use the new one. There are a lot of lines about connection retries and missing peers, but nothing mod-related. I would suspect that it is a network issue. Can you confirm that it is only related to your mod? Did you try other mods and vanilla as well? If you are certain that it is caused in your mod, then I need the .sga to test it and the files to find the cause. Are you willing to send me those? You can send a pm of course if you don't want to publish your source files. 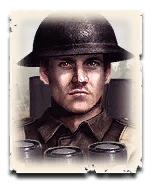 SneakEye already created portraits for UKF MG crew and Mortar team, and for OKW as well. 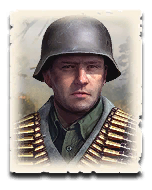 You can found them in All-Units mod. 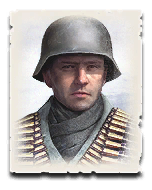 Even several variants, based on Commandos! 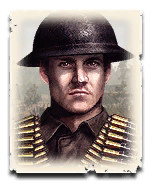 Also, as far as i know, Commanders from the Past mod also has his own variants of these portraits. I can create my own variants, but they will strongly overlapping with these ones. Do you see the files within the modtools? The references to other files won't work in another mod, but you can use them as an example. And I try to make the wood bunker base on your advice, but it is fail, I used the garment's concrete_bunker (german\buildings\defensive_structure\bunker\concrete_bunker_commander_mp) and change the blueprint as below "environment\objects\defenses\wood\wooden_bunker\wooden_bunker", but I got the blue object as below, I don't know how to fix it, kindly advise. This is the entity that is used on several maps which uses the same blueprint. Happy to get your reply! All set now !! The results are turning very good!! Thank you very much! Bust I still have a question, I found the command bar has limited, the maximum amount can be displayed are 6 of abilities, if more then 6, there is not appear? The additional abilities will be drawn on top of the resources, just like the hide button from the cheatmod in your screenshot.